The fallow deer (Dama dama) is a ruminant mammal belonging to the family Cervidae. This common species is native to western Eurasia, but has been introduced to South Africa, FernandoPó, SãoTomé,Madagascar,Mauritius, Mayotte, Réunion, Seychelles, Comoro Islands, Morocco, Algeria, Tunisia, Cyprus, Cape Verde, Australia, New Zealand, Canada, United States, the Falkland Islands and Peru. It often includes the rarer Persian fallow deer as a subspecies (D. d. mesopotamica), while others treat it as an entirely different species. 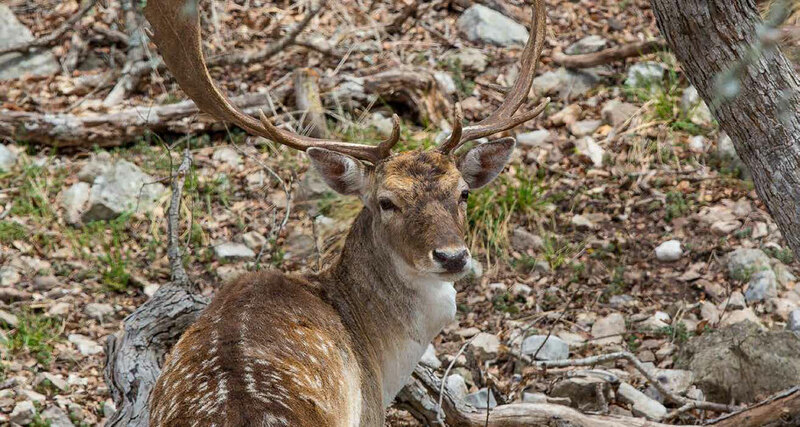 The male fallow deer is known as a buck, the female is a doe, and the young a fawn. Adult bucks are 140–160 cm (55–63 in) long with a 85–95 cm (33–37 in) shoulder height, and typically 60–100 kg (130–220 lb) in weight; does are 130–150 cm (51–59 in) long with a 75–85 cm (30–33 in) shoulder height, and 30–50 kg (66–110 lb) in weight. The largest bucks may measure 190 cm (75 in) long and weigh 150 kg (330 lb). Fawns are born in spring at about 30 cm (12 in) and weigh around 4.5 kg (9.9 lb). The life span is around 12–16 years. Common: Chestnut coat with white mottles that are most pronounced in summer with a much darker, unspotted coat in the winter.Light-coloured area around the tail, edged with black.Tail is light with a black stripe. Menil: Spots more distinct than common in summer and no black around the rump patch or on the tail. In winter, spots still clear on a darker brown coat. Melanistic (black): All year black shading to greyish-brown. No light-coloured tail patch or spots. Leucistic (white, but not albino): Fawns cream-coloured, adults become pure white, especially in winter. Dark eyes and nose, no spots. Agile and fast in case of danger, fallow deer can run up to a maximum speed of 30 mph (48 km/h) over short distances (being naturally less muscular than other cervids such as roe deer, they are not as fast). Fallow deer can also make jumps up to 1.75 metres high and up to 5 metres in length.